I changed my blog name from http://sairahulreddy.blogspot.com to http://blog.sairahul.com. It is very simple to do. You can find the instructions for doing it here. step 1. Create a DNS entry for blog.sairahul.com as follows. step2. Go to your blog setting in blogger and then go to Settings->Publishing->Advanced Settings and enter your blog name here. Now if you go to your new address, you can observe that all your blog entries point to the new address instead of old one. If you go to old address it will get redirect to new one. When you enter http://blog.sairahul.com in browser. The following sequence of steps will happens. 1. Browser tries to resolve the domain name of blog.sairahul.com. Since we have given blog.sairahul.com as CNAME of ghs.google.com, it will get IP address of ghs.google.com. 2. Next, browser will contact ghs.google.com (i mean IP address of ghs.google.com) and set Host field to "blog.sairahul.com"
3. Since Google knows (In step2 we added this) the alias of your blog name it will return your blog correctly. Host name in step 2 is very important. Google differentiates domains using Host name (in other words it maintains multiple domains using same host name). You can test the above theory using nslookup and wget. 1. Get the IP using nslookup. 2. Get the page using wget. If you remove the header option in the above step it will return 404 or if you give different valid host name it will return that page !. You can download the beta version of Firefox here. You can find list of all changes in http://www.mozilla.com/en-US/firefox/3.0b1/releasenotes/#whatsnew. Here i am showing some of the important features i find interesting. Zooming in Firefox is greatly improved. (All because of new rendering engine). 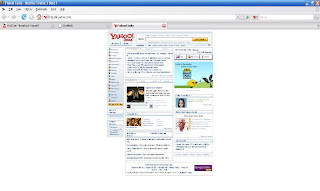 Compare the yahoo home page in Firefox 2 and in Firefox 3 when the page zoomed out. 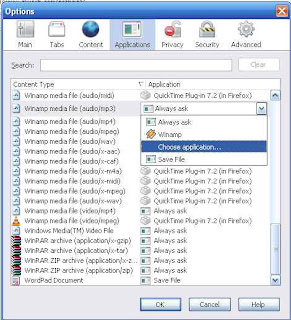 Download manager is integrated. 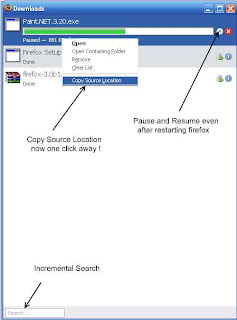 You can now resume the download even after restarting Firefox. Bookmarking now supports Google like star. You can even add tags to the bookmarks. Now the bookmarks will be well integrate with online services like del.icio.us. You can find the summary of the bookmarks in Places. 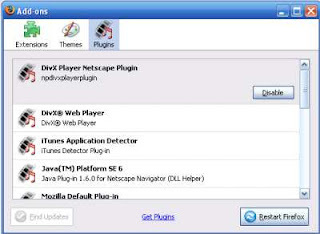 Add-ons now shows installed plugins as well. No need of about:plugins. You can customize the default behavior of the mime type handling. I used to kill Firefox to save the session :) (I know there are extensions now also. I don't want to install any). Now my little hack is gone !. Overall new Firefox features are great. Update on Google Notebook's Infamous Delete Problem ! After observing the above, i viewed the source code using the Firebug after pasting some text from Kate editor. (We have to see the source code before clicking on any other note. If we click on other note the copied text will get deleted) The source code looks as shown below. Now i got little bit idea about what might happening inside. When we create a new note in Notebook, it creates an iframe and puts whatever text we put in body of the document. When we copy some text from the Kate, as i said earlier, it is putting some meta tag before the text. Because meta can't come under body, the newly added html piece of code is wrong. 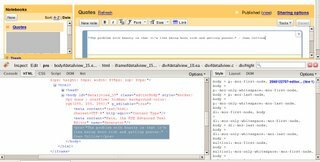 After pasting the code, Google Notebook validating the copied text and deleting it as it is not valid html. 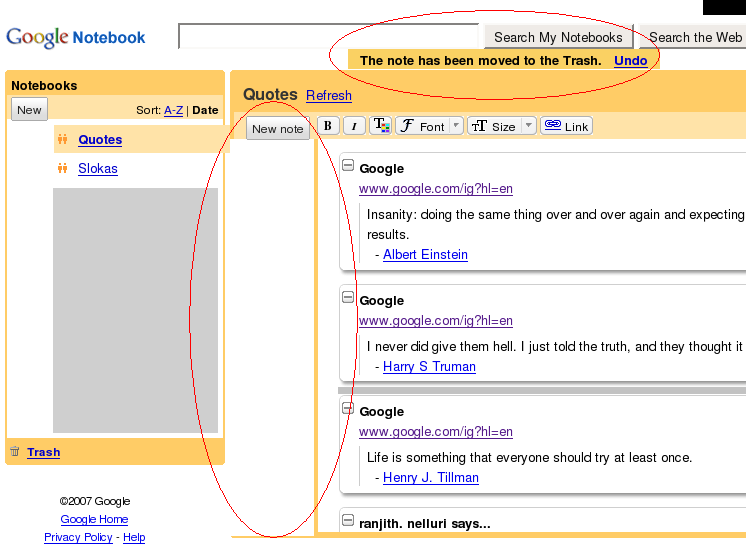 That's why, after pasting the text from Kate, the box becomes empty and Google Notebook always deletes the empty notes when we click on the other note. So it ultimately getting deleting. To cross check it, i deleted the meta notes from Firebug and it works beautifully after that. Because of the same reason, i guess, i can't able to paste the copied text from Kate to Microsoft's Wordpad editor (The default editor that comes with Windows !) . But i can copy it to Notepad, because it ignores the html tags. 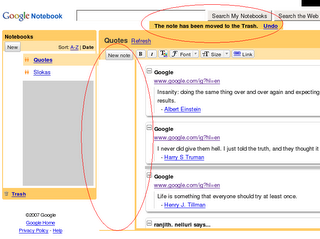 So Google Notebook have to remove the unnecessary meta information. Anyway copying meta information makes no sense. Thanks to Firebug for helping in figuring out this problem !